All retirement communities are not created equal so it's a good idea to take some tours and decide exactly what you want and need both now and in the future. 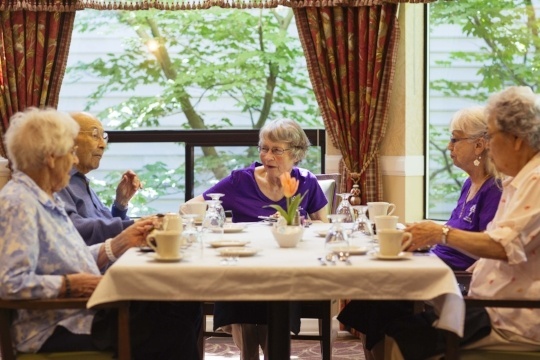 Independent living is just that: living on your own in a community of seniors. Most independent living communities have activities and perks you can enjoy, and at the same time take away the burden of living in a house that needs regular maintenance. Are you ready to downsize to apartment-sized living? Most independent living communities offer condominium style housing, so you have less room as well as no maintenance. The community takes care of repairs, yard work, and all the other responsibilities of homeownership so your time is yours to enjoy. Would you enjoy the social aspects of a community as well as the services and amenities? Most communities offer housekeeping, meals, fitness classes, and activity groups so you can have a full lifestyle without leaving the community. If you choose a tiered-care community you won't have to worry about needing a family member to care for you if you become ill or injured. Most communities have on-site healthcare so you can access nursing care while you recover. Independent living communities usually offer transportation so you won't have to worry about driving or getting a ride to appointments, shopping, and other local trips. Most communities offer full dining services so you won't have to cook unless you want to. If you're ready to tour some independent living communities in your area make sure you plan ahead. Download and print a checklist of things to look for and ask so you don't make a snap decision based on a good salesperson. It's a good idea to tour five or six communities in the area you want to live and narrow your choices down to two or three. Then you can take a second tour of each before you decide whether an independent living community fits with your retirement lifestyle.